One of the great moments of joy for me in 2018 was watching a robot clean my house. It was vacuuming the floor, a never-ending chore in my home with five people, a constantly shedding cat and dog, a 9-year-old who spreads glitter like a fairy with dysentery and wood floors that showcase every speck of dirt and human hair. The dust bunnies that conspired in the dark corners of my home were epic. Some were likely ancient, since the house was built in 1914. Vacuuming was the last thing anyone wanted to do after a day of work. Sure, it wasn’t hard to run our big clunky vacuum over the living room rug every few days, but getting under the couch, tables, beds or (God forbid) the claw-foot tub was a chore requiring multiple people who were only motivated by the threat of outside visitors seeing the filth we lived in. Now that chore is done every day by a robot. Robot vacuums aren’t new. The Roomba debuted in 2002. It’s probably the best known, but it wasn’t the first or the best named. In 2001 a Swedish company introduced the Electrolux Trilobite, named after an extinct sea creature that scoured the sea floor. The differences between then and now are lower prices and more options. Robot vacuums are now in the range of affordability for many households, depending on how sophisticated a vacuum you desire. My brother convinced me I should buy a robovac after he bought one online for around $150. He and his wife raved about what a great job it did and how nice it was to come home to a clean house. We bought the same model, a Pyle PUCRC90 Pure Clean Robot Vacuum Cleaner with a HEPA filter. The round vacuum looks like a bulky scale from the 1980s and comes with a remote to operate it. It charges on a slim base, and its charge lasts several hours. It has a small trap that you must empty by hand when full. If it gets full, it stops until you empty it. It can detect steep drops, so it won’t fall down stairs. It has a little “foot” that comes out when it encounters a short ledge, but it can’t climb stairs. Sometimes it takes multiple attempts for it to clear a hurdle, which makes you feel irrationally sorry for it. The first time we ran this vacuum, I couldn’t stop watching it. The dreaded dust bunnies were being consumed before my eyes in places I rarely ventured. My work was being done for me. It must be the same feeling women had when washing machines, dryers and dishwashers first arrived in their homes (I say women because when those inventions arrived it was mainly women doing the work. Now, in shared-work households, men too can experience this same joy my husband did). As the vacuum returned to its base, it looked like a house cleaner had visited. We had to empty its trap about eight times during its first trip through the house. Now, if we run it daily, we only need to empty it once or twice. It really shows you how much stuff accumulates. 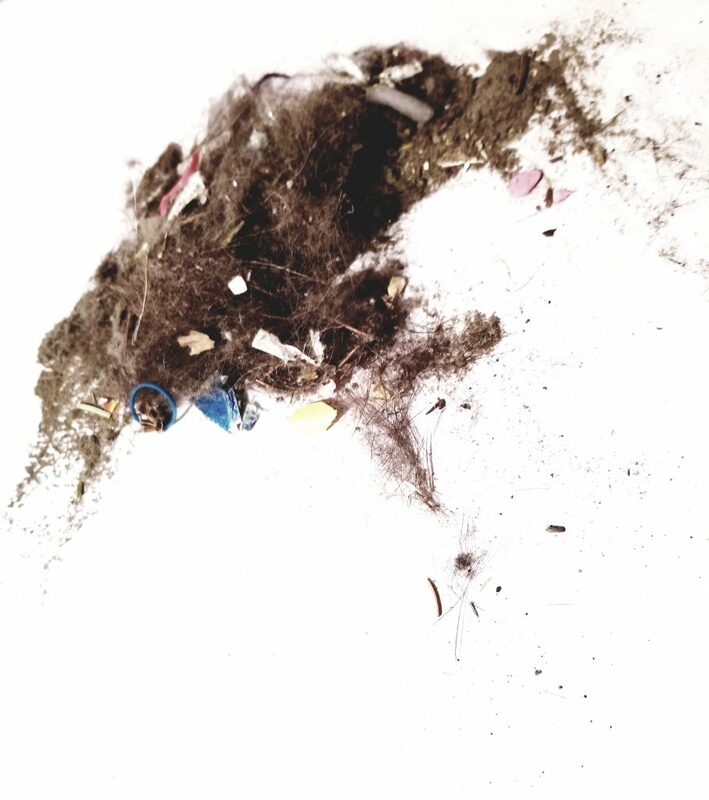 A typical pile of refuse ingested by my robot vacuum. As robot vacuums go, ours is kind of dumb. It runs into walls and edges and sometimes goes over the same spot dozens of times, but eventually it gets everywhere. One must be diligent about picking up anything it might get caught up in. At my house this has included a particularly shaggy rug, the bottoms of curtains, shoelaces, cords and socks. Most of the time it will shut off until the offending object is manually removed. This doesn’t apply to all things. Someone told me a story about a how a friend’s robovacuum ran over a pile of dog poop. It never recovered. When the vacuum’s battery is low, it’s supposed to return to its home base. It doesn’t always make it. Whether suffocated by a sock or just out of juice, it may stop while under something. It beeps several times when it stops, but if you’re not around to hear it, you may have to initiate a search and rescue. “Find the vacuum,” has become a common refrain at our house. There are dozens of robot vacuums on the market available at vacuum dealers, department stores and online. Cost varies according to their capabilities. 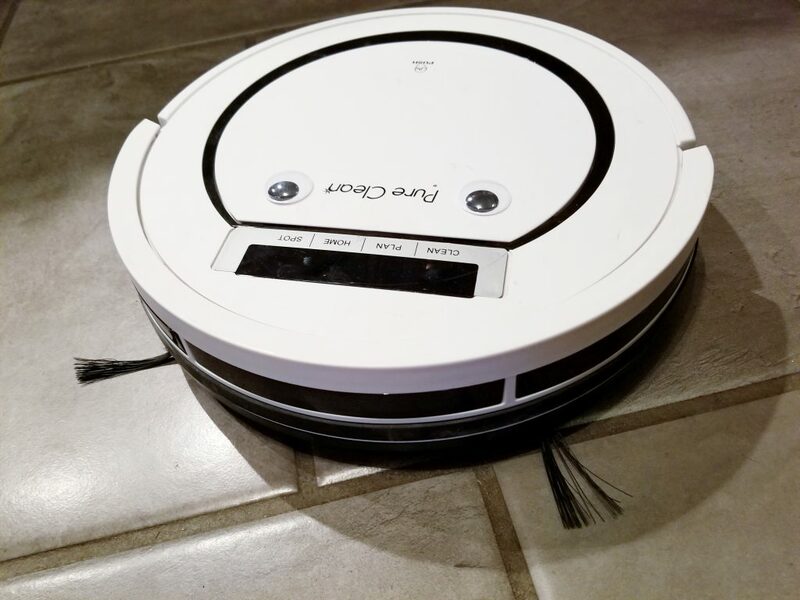 The latest version of the Roomba retails for around $1,000. It’s self-cleaning, meaning it empties on its own so you can go weeks at a time without dumping the accumulation of gunk from its home base. You can connect to it from an app on your phone to find out what it has done. It maps its surroundings, making it more efficient than my bumbling bot. But I am more than happy with my simple model, which was busy sucking stuff up under my bed as I finished this review.